Christmas is a wonderful joyous time of year, with children laughing, snow and of course ornaments, decorations and fresh cut trees. Here at Jared’s you can find all of those (you just have to bring the laughing children). With over a thousand tree ornaments, collectibles like Mark Roberts and Patience Brewster, Silver Forest earrings and amazing home décor. 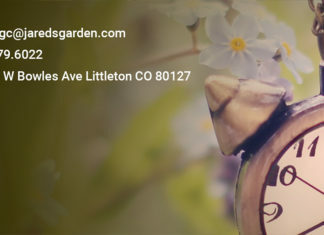 Come visit the Garden Center now to browse our wide selection of gifts and decor. Not to mention: flameless candles, Colorado honey, collectible elves and fairies, fresh wreaths and garland, fresh cut Christmas trees, Hammonds candy canes and more! Native tree that can last till February once decorated. Can be blue or green in color,light fragrance open branching. N Carolina tree that has glossy green needles with a silver underside. Sweet fragrance and holds its needles very well. Branches layer nicely with a dark or bright green. This tree holds needles well but will drop them as the tree dries out. Hypoallergenic tree for those with allergies but want a real tree. Gorgeous dark green needles with a silver underside.